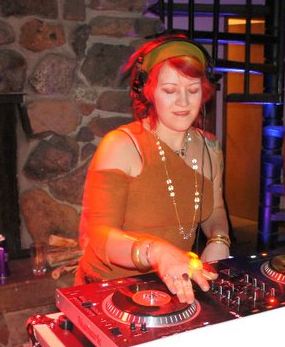 In 2010, DJ Layla is celebrating 10 years as a pioneering female DJ in the Pacific Northwest and beyond. Her DJ career began under the moniker DJ Velo in Portland in late 2000, where she was an active member of the underground rave community and took a particular interest in getting more women behind the decks. She began hosting a monthly potluck for women interested in learning to DJ, and eventually founded SisterPDX, the Portland chapter of a female DJ collective based in San Francisco. After a move to Eugene, she dropped her former DJ identity, studied tribal style bellydance, and began to explore the sounds of world fusion electronica as DJ Layla. Simultaneously, her DJ identity also morphed in conjunction with her foray into the world of weddings! She is co-owner of TrueLove Sound with her husband Jeff, and one of few women who work in this amazing industry. Her current musical selection reflects this varied experience as a DJ, and in her sets you are just as likely to hear a great funk, pop or disco remix as you are some diva vocal house, underground tribal trance, a killer breakbeat, or whatever moves the crowd!